A simple sign, goodness awaits... . 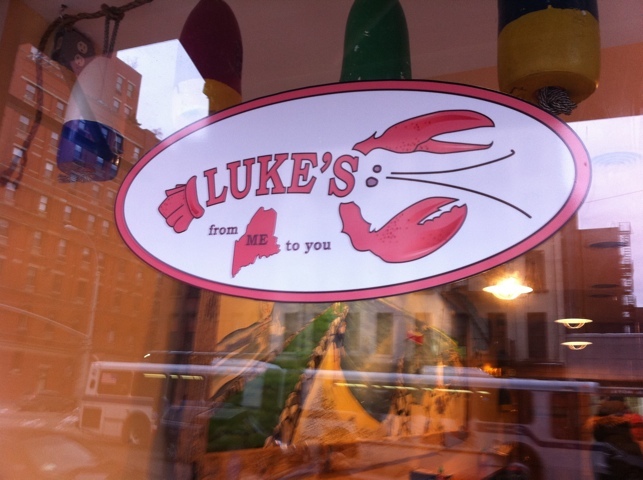 Stumbled upon Luke’s Lobster while looking for a place for seafood on the Upper East Side, and was amazed by the Zagat ratings it got (a 25 for food? Really?). So imagine my delight when I found out that this small, emerging chain of lobster shacks had an outpost on the Upper West Side. It is a small storefront, made to resemble a humble lobster shack by way of Maine. Turns out they’ve been around for about a month on the UWS. As you can see from the prices on the menu above, they’re not cheap, but I have to say, for the quality involved, they’re worth every penny… they may even be an out and out bargain. For the record: two lobster rolls, a cup of New England clam chowder, two sodas, two chips and two pickles racked in at $44. So how was it? 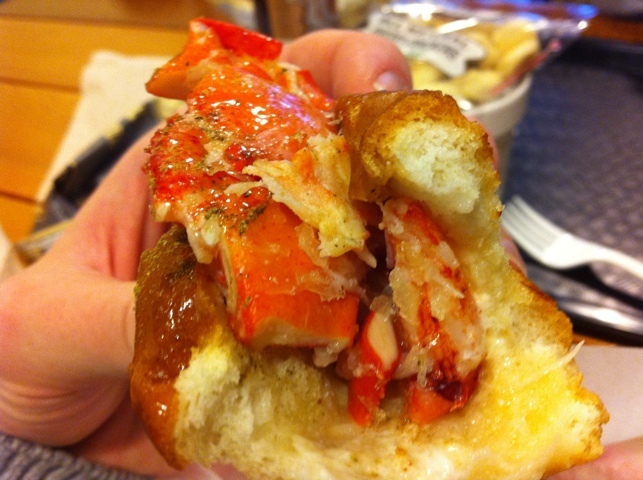 As you can see, the lobster roll is filled with large chunks of fresh lobster. 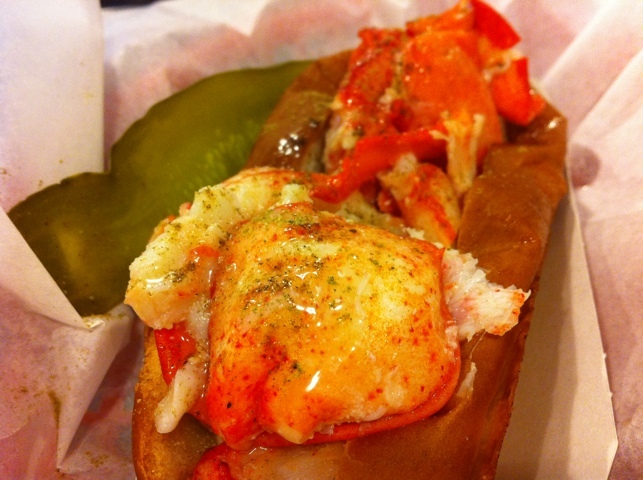 It is prepared in what Luke’s calls “Maine” fashion, meaning that the lobster itself is chilled, although it is served in a toasted bun with hot drawn butter ladled atop it. Below the lobster meat is a thin smear of mayo, not enough to overwhelm the flavor or drip from the lobster chunks, but enough to add a nice fat to the experience. Chunky happy. Notice the spices and golden butter. Their mix of spices is to me a bit odd. They are not overwhelming, they add a zest, I admit, but frankly I found them distracting to the experience. Happily Luke’s allows you to order your rolls minus the butter, mayo or spices. Next time I might skip them, maybe not. By the way, the sandwich is delicious. 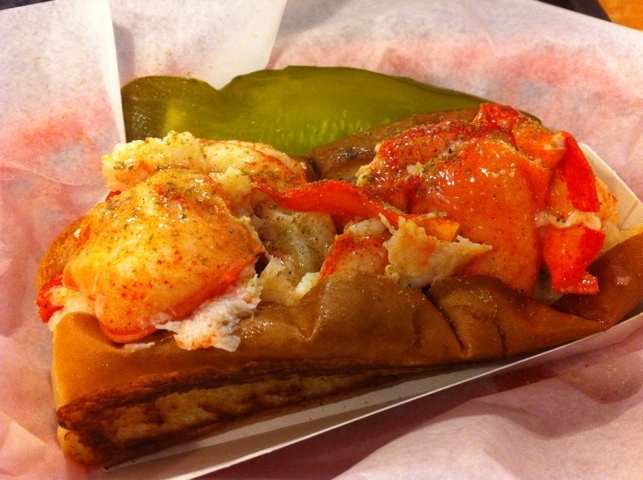 The chunks of lobster are large, fresh and delicious. It is not upsetting that they are chilled, because they other surprise star of this meal is the utterly sensational toasted bun! It’s wonderful. Crispy, buttery and flavorful – very rich. The crispiness of the toasting in particular is truly rewarding, it is a welcome counterpoint to the softer, more tender texture of the lobster. The only niggle I have with the sandwich is that lobster itself seemed to be a bit dripping with water, I wonder if that’s to do with how it’s stored in the kitchen after it is cooked. 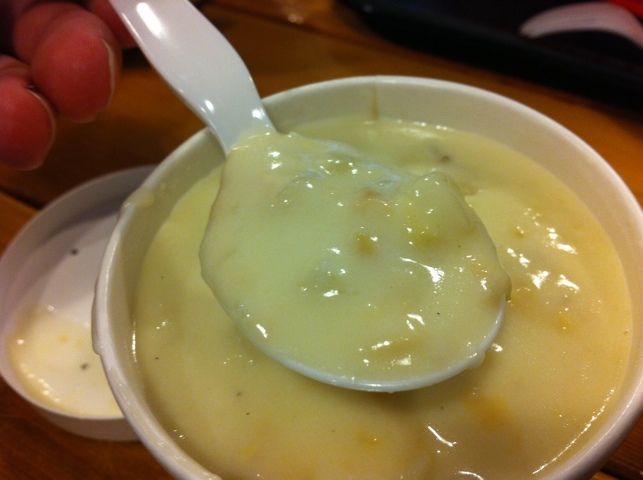 The clam chowder from Luke's Lobster is thick, rich and great. After devouring the lobster roll, I turned my attention to the clam chowder. I wasn’t expecting much, but my expectations were upended. When I first sliced my spoon into it, I could see and feel how thick the broth was, and how pleasantly chunky the soup was to boot. It too excelled – very rich and buttery, filled with clams and potatoes and more. It is not the best chowder ever, but it’s better than you’d expect for mass produced. 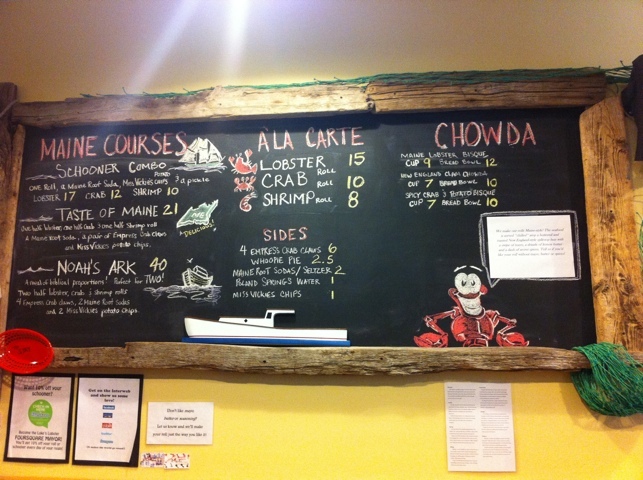 All in all, Luke’s Lobster is full of win, and I can’t wait to go back again. It is a welcome, welcome addition to the neighborhood. I have no idea how they are going to cope with the incredibly long lines that seem certain to occur during warmer weather. Now that it’s here, I am not sure the haul out to the Red Hook Lobster Pound is entirely necessary (even though they too are wonderful). BTW, neither are enough to dethrone the greatest sandwich in the world.